Avoid watering in the middle of the day. Watering in the morning allows for the water to be absorbed before evaporating in midday heat. If using sprinklers, use larger drops close to the ground. The water in misters can evaporate quickly. When watering, always comply with your water system’s restrictions. Download our Landscape Irrigation Guide. 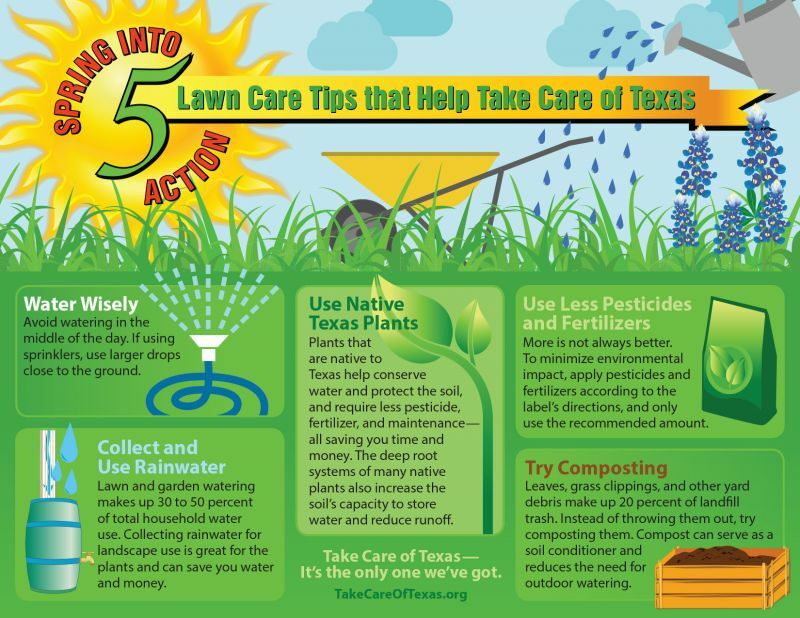 Lawn and garden watering makes up 30 to 50 percent of total household water use. Collecting rainwater for landscape use not only is great for the plants, but can save you water and money. By collecting rainwater from just 10 percent of the residential roof area in Texas, we could conserve over 30 billion gallons of water annually. Watch our "How to Build a Rain Barrel" video, and download our Rainwater Harvesting with Rain Barrels Guide. To build a more complex capture system, download the Rainwater Harvesting Manual. More is not always better when fertilizing your yard. Excessive watering or a rainstorm can wash away the chemical excess—wasting your money and endangering nearby waterways. Misapplication of fertilizer is the most frequent cause of surface and groundwater contamination. To minimize environmental impact, apply pesticides and fertilizers according to the label’s directions, and only use the recommended amount. Download our Managing 10 Common Texas Yard Pests Guide. Leaves, grass clippings, and other yard debris make up 20 percent of the trash sent to landfills each year, and it costs Texans over $250 million a year to collect and dispose of that waste. Instead of throwing them out with the garbage, try recycling yard materials by composting them. Compost can serve as a soil conditioner that nourishes your yard and reduces the need for outdoor watering up to 60 percent. Watch our "How to Start Composting in Your Own Backyard"video, or download our Mulching and Composting Guide.